Today we drove all the way to my Grand(hu)ma's house! 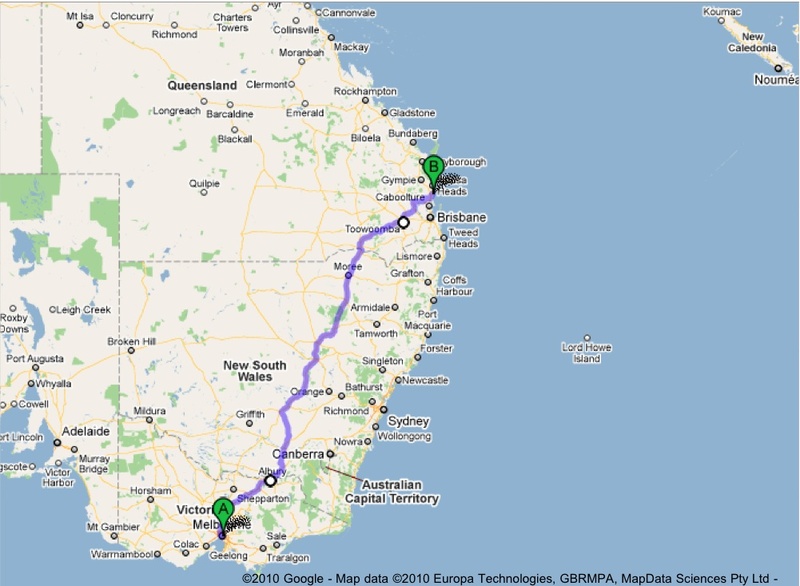 It was about 440kms, and it took us from 7.30am until 2pm. We left early because there were a lot of Drilling Men in the units around us, and they got up at about 5.30. I told them off for getting up so early, and then my human decided maybe we should get up too. This is the way we went. The first thing we did when we left was take a rest break. We went to get some more smelly stuff for the car, then we we went to MacDonald's. My human says they are good for breakfast when you are on the road, but I think she likes them for breakfast when she's going by tram or walking, too. I got to have some little pieces of egg and bacon, which made a nice change from kibble. Then we were on our way! First we stopped at Milmerran, which is about half way to Toowoomba, and then we stopped at Esk, which is PicturEsk, according to the big sign. 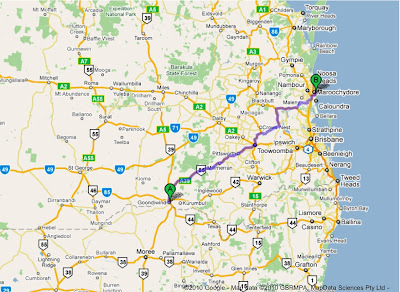 Then we went past the Glasshouse Mountains, and through to Beerwah. The only place we got a little lost on the whole trip was in Beerwah, which my human thought was very funny, because her family has a farm there, so she's been visiting since she was a teensy pup and used to know the way really well. But they've put in a lot of houses and changed all the roads around since the last time she was there, and the way she was used to taking had gone away - and the beepy machine didn't know where to go either. My human figured it out eventually. 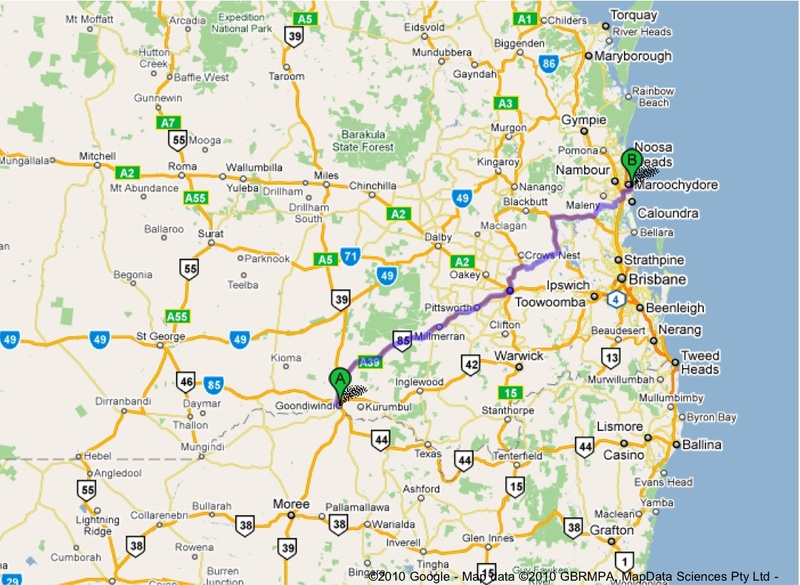 The other thing that's in Beerwah is the Australia Zoo, which was put there by The Crocodile Human. When my human was a pup, it used to be called the Queensland Reptile Park. My human's family once found a crocodile in the dam on the farm. It was a bit lost, wa-a-ay too far south, so they called The Crocodile Human and he came and caught it and gave it a new home. My human says she never saw a crocodile in the dam, just tiger snakes swimming on the surface, and yabbies swimming underneath. She used to tie pieces of string around Dougal The Cat's dinner meat, and try to catch yabbies. She never knew what to do with the yabbies when she caught them, so she would throw them back. 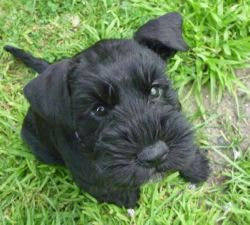 And make sure her Grandma gave Dougal more food. She also used to help her Grandad milk the cows and then help her Grandma make butter from the milk, when she even younger than I am in dog years. But enough of that, this blog is about me! When my human finally stopped talking about herself (yawn!) we were at the Sunshine Coast, and next thing, we'd arrived at my Grand(hu)ma's house! The first thing we did was get out of the car, and immediately go for a walk, before we even said hello to anyone. 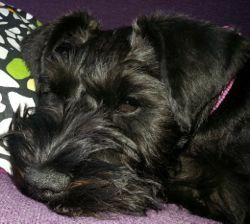 Then my Grand(hu)ma and her Peter brought Heidi and Lexi, their two Schnauzer girls - my cousins - to meet me in the park. Here's a picture of me in the park. Then we went for a run alongside the river. Here's my cousin Heidi, and me in the background. Heidi's a lot older than Lexi or me, and she has a nubbin instead of a tail. They're not allowed to do nubbins any more, here in Australia. So Lexi doesn't have a nubbin, and she has lots of hair on her tail. I get mine clipped short, so that's how the humans can tell us apart. They are very nice girls, and not nearly as evil as they look in this picture. That's Lexi on the left and Heidi on the right. Well, obviously that's me on the far left! Now we get to stay here for almost a week - no more driving! But then we have to go back home again. 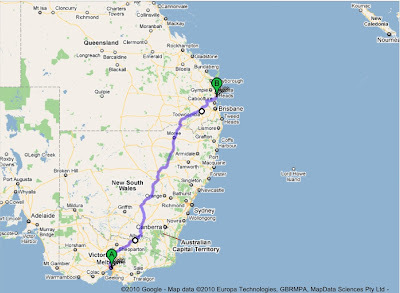 It would be quicker for us to drive to New Caledonia from here, than back to Melbourne! Oh Sasha, what an amazing adventure! Your human is incredible to drive all that way, we are most impresed. We don't like to show we're impressed with our humans very much as we feel it goes to their heads (and therefore messes up our training of them!) but your human is pawsome, so please give her a snuggle from each of us! We're glad you got there safely - looks like you're going to have some great walks whilst you're there. We really loved the photo of the three of you - um, is there a chance it could soon be Sasha plus sister??!! I'm glad you finally reached your destination. As you may know I only have a nubbin. My people picked me out when I was only 2 days old, but my tail was already gone! 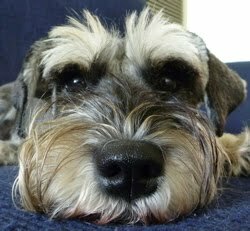 The breeder said that schnauzer have ugly rat tails, but from all of my scnauzer buddies I now have from blogging I know that she is a liar. I think she is just jealous because she doesn't have a tail. 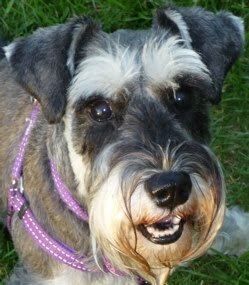 Trails & tripulations: Home, Schnauzer Home!